Little Heath Pieris is a delightful evergreen flowering shrub that provides outstanding four-season interest in the garden. 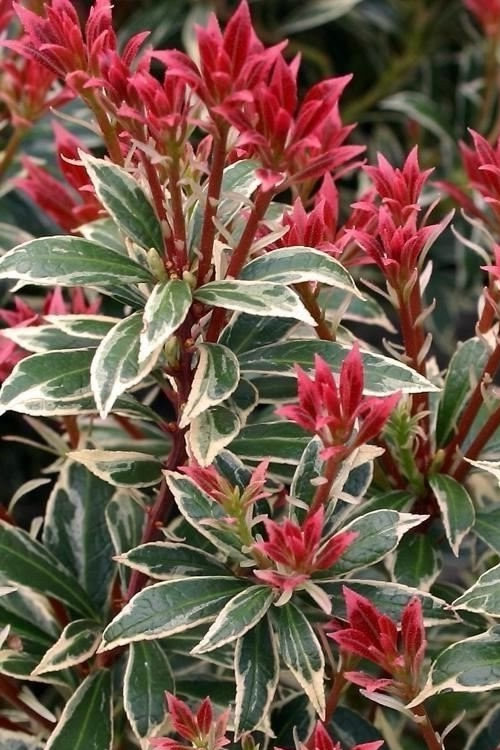 In spring, flaming red to pink new growth emerges at the ends of branches above attractive mounds of variegated white and green dainty little leaves. Get all the details below! Little Heath Pieris, also known as Lily of the Valley Shrub or Andomeda, is a delightful evergreen flowering shrub that offers outstanding four-season interest in the garden. In spring, flaming red to pink new growth emerges at the ends of branches above attractive mounds of variegated white and green dainty little leaves. 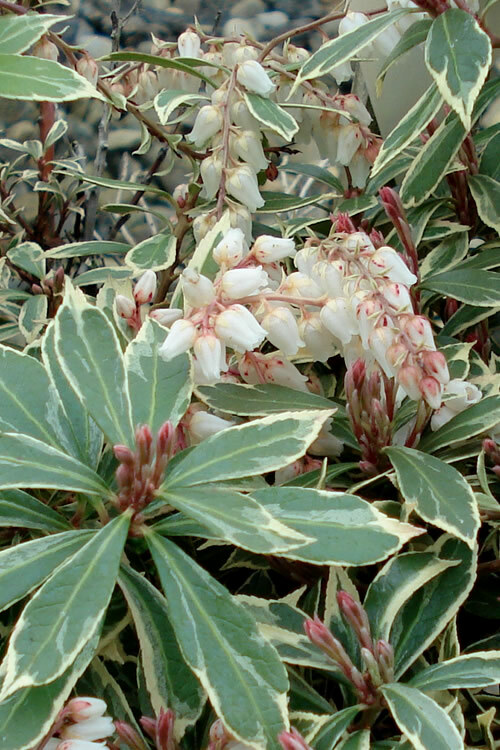 Before this colorful new growth emerges are racemes of fragrant, bell-shape white flowers. 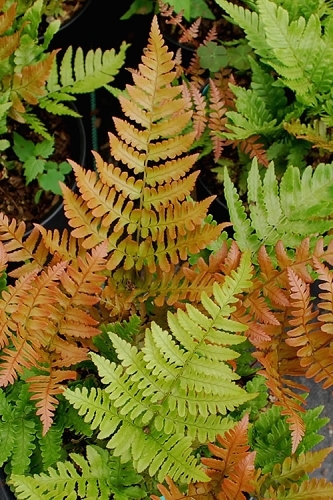 The foliage takes on a delightful rose blush color when cooler temperatures arrive in fall. Makes an attractive sort of bonsai effect as it ages. Note: We don't have long term experience with this variety so are not sure about mature height and width over the long term. Some sources say 2 feet tall while others say 5 or 6 feet tall. We suggest leaving a space of at least 5 feet in diameter for this one to grow. 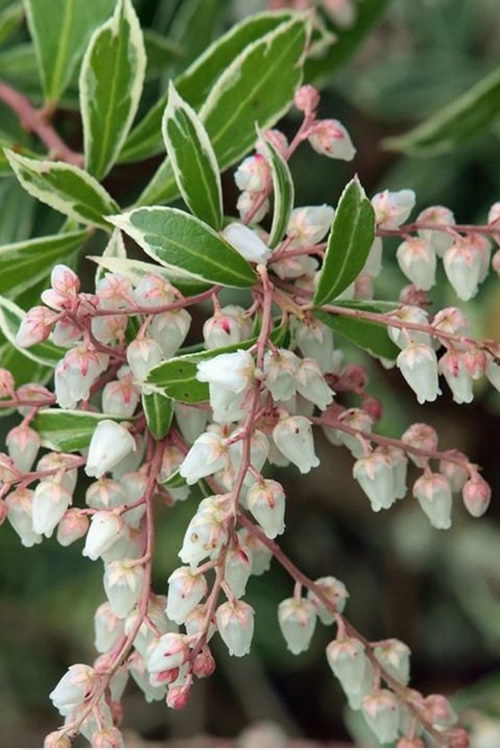 Little Heath Pieris is ideal for use as an accent or in groupings in shady to partially shaded landscape and woodland borders and home foundation plantings. It's smaller size lends well to container gardens and it's a fine addition to woodland gardens, Asian-theme gardens, and cottage gardens. Little Heath Pieris is very easy to grow. Plant in a moist but well drained acidic soil that is rich in organic matter. Add organic compost to heavy clay or poor quality native soils. Pieris prefer growing in a site that provides morning sun with afternoon shade or all-day filtered sun or dappled shade. Avoid direct afternoon sun. Note: Find helpful advice from our experts under the Planting & Care tabs above on desktop monitors or below on mobile devices. Height at Maturity: 2-4' or more? Width at Maturity: 2-4' or more? When planted right and in the right spot, Pieris plants are easy to grow and care for in garden beds and containers. Pieris prefer a moist but well-drained fertile soil that is rich in organic matter. 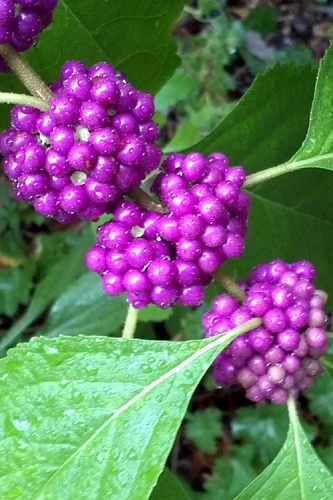 As with so many other ornamental plants, constantly soggy or wet soil can be problematic. 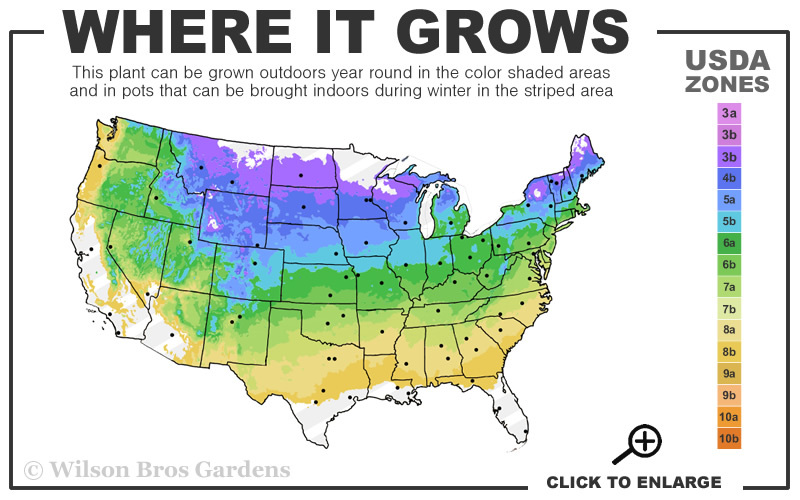 So make sure to plant them only in well-drained sites. If you are uncertain about soil drainage in the area you intend to plant your Pieris, it's well worth taking the time to test the drainage before planting. To test soil drainage, dig a hole 12" wide by 12" deep in the planting area. Fill the hole with water and let it drain. Then, after it drains, fill it with water again, but this time clock how long it takes to drain. In well-drained soil the water level will go down at a rate of about 1 inch an hour. A faster rate, such as in loose, sandy soil, may signal potentially dry site conditions and a need to add some moisture retentive organic matter. A slower rate indicates poor draining soil and is a caution you need to improve drainage, plant in a raised mound or bed, or look for plants that are more tolerant of wet or boggy conditions. Pieris grow best in an acid to moderately acid soil ranging from 5.5 to 6.5 on the pH scale. Most average garden soils fall between a pH range of 6.0 to 7.0. Soil pH is a measurement of the alkalinity or acidity of soil and is measured on a scale of 1-14, with 7 as the neutral mark. Any measurement below 7 indicates acid soil conditions, and anything above 7 indicates alkaline. If you're unsure about the pH of your soil, or whether or not it's suitable for growing Pieris, it's a good idea to test the soil pH in the planting area. Pieris grow best in sites that provide partial shade. Morning sun is fine. All day dappled shade or filtered sun is fine. Avoid direct afternoon sun. Depending on the type, fertility and porosity of the soil in the planting area you might consider amending the native soil. When planting Pieris in dense clay or poor soil it is beneficial to thoroughly mix in some good organic matter such as composted cow manure, mushroom compost, or a good planting mix at a 50/50 ratio with the soil removed from the planting hole. When planting in very sandy, quick-draining soil you might mix in some top soil, peat moss and/or compost to help retain moisture. When planting in a moist but well-drained fertile soil there is no need for adding a soil amendment, though some composted organic matter might be beneficial. To remove your Pieris from the nursery container it was growing in first squeeze the sides of the pot to loosen root ball. Then, firmly grasp the base of the plant and try to very gently lift and remove the root ball from the container. Be careful not to damage your plant when removing it from its container. If the root ball is stuck in the container use a snipping or cutting tool to cut the container away. Then, carefully loosen some feeder roots around the surface of the root ball. To plant, set your Pieris in the planting hole so that the top edge of the root ball is slightly above ground level, to allow for settling. 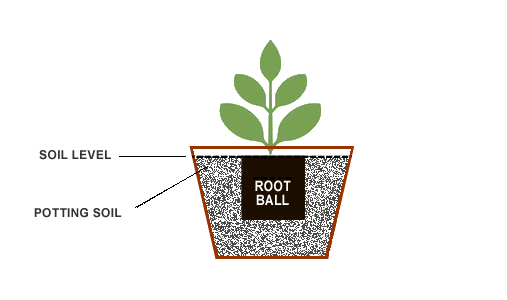 If your soil is moderately drained (holds water for an extended period after rainfall or irrigation) the top of the root ball should be 2 to 3 inches above ground level, as shown in the illustration below. If necessary, add some backfill soil mixture to the bottom of the hole to achieve proper planting height. NOTE: If the soil in the planting area is poorly drained (constantly soggy or wet) improve soil drainage or choose a different type of plant that is tolerant of wet soils. After setting your Pieris in the planting hole, use one hand to hold the plant straight and your other hand to begin back-filling your soil mixture around the root ball, tamping as you go to remove air pockets. When you have filled the hole to the halfway point you can soak the soil. Then continue back-filling to the top edge of the root ball. If you are planting higher than ground level taper your soil mixture gradually from the top edge of the root ball to the ground level, as shown in the planting dillustration above. When planting on a slope, plant with the top surface of the root ball at the same angle as the slope. To avoid suffocating your plant, avoid placing soil on top of the root ball. If planting your Pieris in a location far from a water source and in well-drained soil, you can use remaining soil mixture to build a 2- to 3-inch water retaining berm (catch basin / doughnut) around the outside perimeter of the planting hole. This basin will help to collect water from rainfall and irrigation often reducing the need hand-watering. The berm can be removed after a couple growing seasons. Next, deeply water the planting area, including the root ball, to a depth equal to the height of the root ball. For an extra boost, to stimulate early root formation and stronger root development you can also water you newly planted Pieris with a solution of Root Stimulator, which reduces transplant shock and promotes greener, more vigorous plants. To conserve moisture and suppress weed growth, spread a 1- to 2-inch layer of shredded or chipped wood mulch or 3-4" layer of pine straw around the planting area. As the mulch decomposes it will add vital nutrients to the soil that your plant will appreciate. Avoid the use of freshly chipped or shredded wood for mulch until it has cured in a pile for at least 6 months, a year is better. Avoid placing or piling mulch directly against the base of your plant as this could cause the bark to rot. 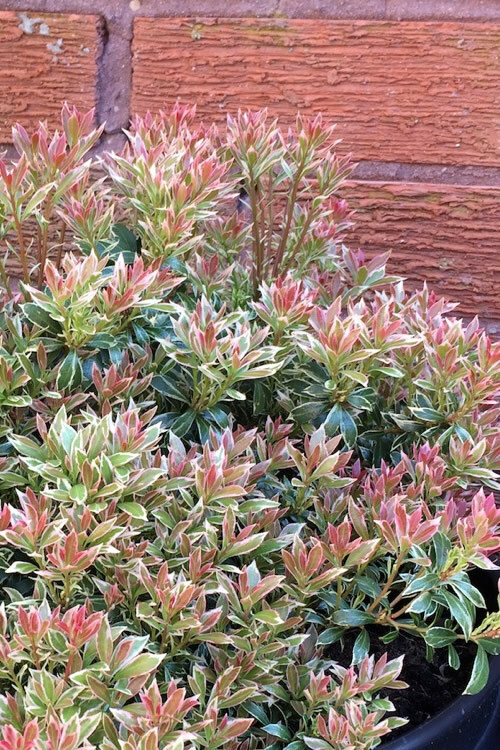 Pieris growing in pots appreciate a moist but well-drained soil. Constantly soggy soil can and often will cause root rot or other harmful or deadly plant diseases. Therefore, choose a pot with a drainage hole(s) and use a quality potting soil or potting mix, or a 50/50 combination thereof. To enhance soil drainage, you can add 10 or 20% perlite or pumice to the soil mixture. As mentioned, make sure to choose a container with a drainage hole(s) at the bottom and also one that is large enough to allow for 2 to 3 years of growth before shifting up to a larger size container. 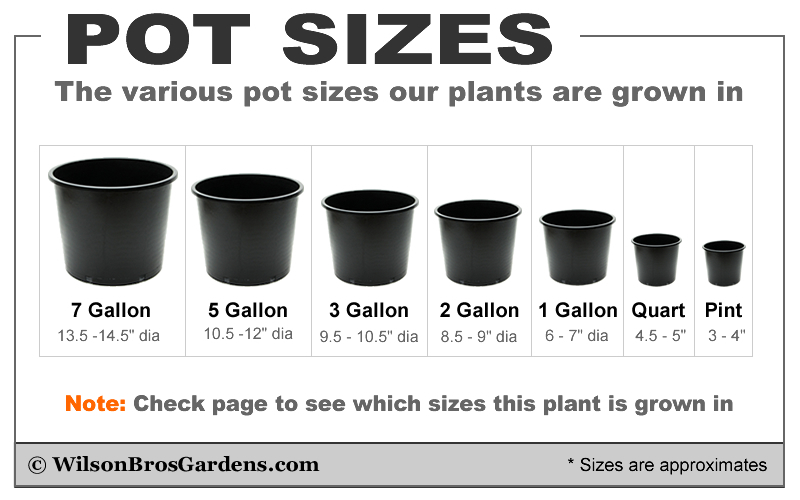 This might mean your planting pot would be 6 inches or more in width than the root ball of your plant. Container color will matter as well. Not only will you want to pick a color of container that goes well with the flower and foliage color of your Pieris, you'll also want to pick a container that matches the style of your home or other structures and other plants in the surrounding environment. Pour a small amount of your soil mixture in the bottom of the container. Set your Pieris in the container and make necessary adjustments by adding or removing some soil so that the top edge of the root ball will sit 1/2 to 1" below the rim of the container. Apply a 1/2" layer of wood chips or sphagnum moss to soil surface for decorative purpose and to help conserve moisture. Pieris will benefit from fertilization. 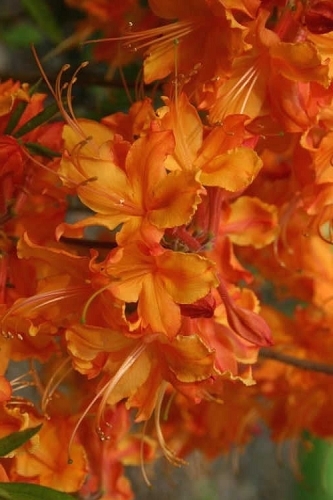 Feed them in spring with an acid-forming fertilizer such as azalea, camellia & rhododendron food or a slow-release shrub & tree food, preferably one that contains Sulfur and/or Iron. Alternatively, you can feed with a natural organic plant food, preferably one that contains Iron. Feed Pieris growing in containers as directed on the product label with a slow-release granular or water soluble fertilizer listed for use in containers. Pieris grow best in an acid to slightly acid soil ranging from 5.5 to 6.5 on the pH scale. Most average garden soils fall between a pH range of 6.0 to 7.0. Pieris prefer a moist but well-drained soil, however are tolerant of dry periods when established. They will not tolerate constantly soggy or wet soil conditions, which can lead to root rot and other harmful plant diseases. So be careful not to overwater them! Immediately after planting deep soak the soil in the planting area, including the rootball, to a depth equal to the height of the root ball. For an extra boost, you can water your newly planted Pieris with a solution of Root Stimulator, which stimulates early root formation and stronger root development. Root Stimulator reduces plant shock and promotes greener, more vigorous plants. In average garden soil you should not have to water your newly planted Pieris every day. More often than not, this causes soggy soil conditions that can lead to root rot and other plant diseases. In the absence of sufficient rainfall, water only as needed to keep the root ball and surrounding soil damp to moist. Keep in mind that deep soaking less frequently and allowing the soil to dry out somewhat before watering again is much better than splashing just a little water on the plants every day. 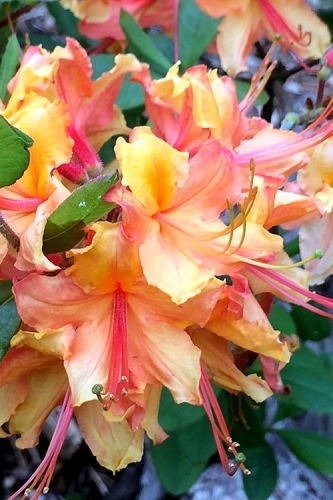 Rhododendrons planted during the winter dormant season, when plants are not actively growing and evaporation is much slower, will require much less water. 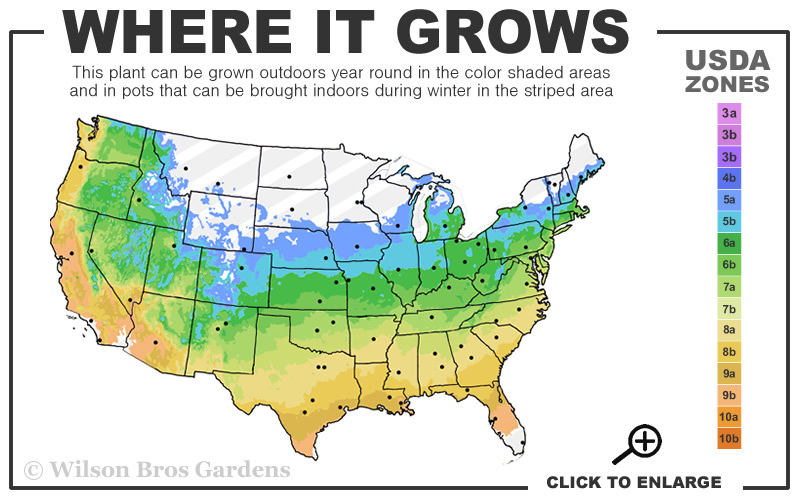 So, be extra careful not to overwater during winter! When established, Pieris are moderately drought tolerant. That being said, during prolonged periods of summer drought and excessive heat it's a good idea to water younger plants deeply at least once a week until normal rainfall resumes. During a drought, wilting leaves or new stem tips are indicators your plants could use a good deep soaking. Just make sure to check soil moisture before watering. Pieris do not require pruning, however can be pruned to keep the plant tidy. A stray or damaged branch can be removed any time of year. Deadheading spent flowers can be done right after bloom and will help the plant to produce more flowers the next spring season. To deadhead, use fingers or a sharp pair of bypass hand pruners to remove the spent flower cluster at the stem, taking care not to damage nearby growth buds. Prune dead branches back to their origin using bypass hand pruners. In the case of broken branches, prune to a strong, lateral branch.